A year ago, the MHI Board of Governors and the members of the Annual Conference Workgroup—the committee responsible for planning the event—unveiled a modified format for the MHI fall gathering. Historically known as MHI’s Annual Meeting, the consensus among MHI’s volunteer leadership was that the event could offer additional membership value. Most of the work conducted at the Annual Meeting, and at its counterpart event held in the spring, focused on our organization’s 17 Product Groups, with a few keynote addresses sprinkled throughout. While the meetings were productive, MHI’s leaders felt making some changes would increase the value of the event for members. So, in 2014, an Executive Summit was added on Sunday afternoon, recalls John Paxton, vice president and general manager of MHI member Terex Corp. and current president of the MHI Board of Governors. Paxton also chairs the Annual Conference Workgroup. “The half-day Summit targeted C-level attendees with keynotes centered around a strategic planning perspective, and there was a focus to engage the user community. Feedback from participants about the content we included in those sessions was so resoundingly positive, we decided to expand the entire event,” he says. 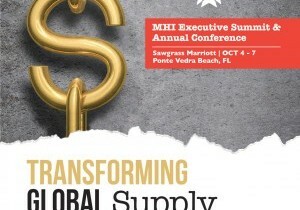 Learn more about the MHI Executive Summit & Annual Conference.